How does Santa get around the world in one night? ðŸ˜‚ Chuckle at Christmas Jokes! ðŸŽ… Super Silly Santa Jokes! â˜ƒï¸� Frosty's Funny Snowman Jokes! around the world to deliver gifts in one night? The (Saint) Nick of Time! I'm Santa's Grumpy Elf. So you want to know how Santa gets to everyone's home all around the world to deliver presents in just one night? So how does he do it? We like to say he does it in The Saint Nick of Time . There's only one little problem. I can't tell you how Santa gets to everyone's home in just one night because -- it's another Santa SECRET! After all, what would it be like if everyone knew how to get around the planet in 24 hours? There would be people appearing and disappearing all over the place! It would be CRAZY! Can you imagine trying to arrange a playdate? There are, however, lots of ways Santa can get around the world in 24 hours. I'm going to share those with you and let you decide! Keep reading to find out more about Santa's sneaky sleigh-flying shenanigans! This is the oldest answer to how Santa gets around the world in one night. Santa and the elves created the top secret formulae for magic a long time ago. They've had centuries to perfect it and make lots of it! Santa is a Time Bender! Where does Santa live? The North Pole. Where do all the time zones in the world meet? The North Pole. Let's Do TheTime Warp Again! Elves cracked the secret of Time Warps and Wormholes a long time ago (well, it was only a few seconds ago if you know how to time travel back to when they did it!). They use science so Santa, his reindeer and sleigh can sit in a small bubble of the space-time fabric. They use the reindeers' antlers to create and keep the bubble going. Of course, the elves' wormhole technology also means Santa can use cosmic short-cuts (that means time-travel). When you can time-travel, it's really easy to visit all the homes in what appears to be one night. Matter and anti-Matter work like that. Except, Matter and anti-Matter release a LOT of energy when they collide. They release enough energy to easily go to Mars. So, using that energy to go around the Earth is child's play . You only need two things to fly around the world in one night: lift and desire (thrust). Everyone knows Santa's special reindeers' antlers are big, very big. They are specially designed to catch children's Christmas wishes and dreams. These wishes and dreams give Santa and the reindeer the two things they need: 1. the lift in their spirit and, 2. the desire to make more children happy. Once presents start to be delivered, Santa's reindeer fly ever faster. As children around the world open their presents, the children are filled with pure Christmas joy. (See the section It's Not Just 24 Hours! ) The reindeer's antlers catch the children's Christmas joy too. This joy gives the reindeer and Santa even more of a lift and thrust. They fly and work ever faster delivering more presents for children to open! This virtuous circle makes it so the sleigh essentially floats on air and the presents deliver themselves! Have you ever heard of Albert Einstein and his Theory of Relativity? Einstein showed that time runs at different rates for observers who are moving relative to one another. This is why time passes more slowly for excited children waiting for Santa. Christmas Eve moves relatively slowly (ok, it takes FOREVER!) for everyone else. But for Santa, he is moving at the speed of light! E=mc2 after all just means Eve = Merry Christmas squared . It's Not Just 24 Hours! How does Santa get around the world in one night? Santa's a cheater! There, I said it. Are you happy? I'm not, I'm still a grumpy elf. Have you heard of time zones? Well, Santa uses them to cheat -- on time! He takes advantage of the Earthâ€™s time zones! He starts by delivering presents at the International Date Line and travels west following the Earth's rotation around the sun. By doing that he gains many, many extra hours of time. Children are actually waking up and opening presents while Santa is still delivering! (See the section about how Santa and the reindeer are Riding Christmas Magic ). Did you know that, if you live in the U.S., today is already tomorrow in Australia? Likewise, when Santa is in Australia, it is already yesterday in the U.S. This is a handy trick to know when you're Santa Claus! So don't take my word that Santa can get to everyone's home all around the world to deliver gifts in just one night! If it wasn't true, why would Google and NORAD (jointly run by the Canadian AND U.S. governments!) still track Santa every year? I'm just glad NORAD knows Santa is real so they don't accidentally shoot him down! Answers to more questions about Santa, Mrs. Claus, the elves and reindeer! Tweet About the Nick of Time ! Get a reminder to come back to emailSanta.com closer to Christmas! 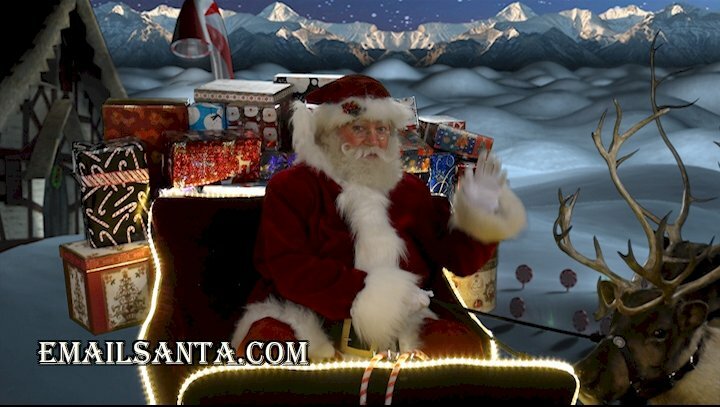 Come on Christmas Eve Day to watch Santa & his reindeer LIVE on the Santa Snooper! You can also help "Elf Control" track & talk to Santa Claus on his famous flight & send him emails! Â© Copyright 1997-2019 emailSanta.com Inc.